Extra Large (46.8mm x 47.1mm) 18K white gold case, transparent back, silvered guilloché and lacquered dial with sun-like finish, automatic winding calibre 8101 MC movement with chronograph function, alligator strap with 18K gold double deployant buckle. Water resistant to 30 meters. Extra Large (46.8mm x 47.1mm) 18K white gold case, transparent back, silvered guilloché and lacquered dial with sun-like finish, automatic winding calibre 8101 MC movement with chronograph function, 18K white gold bracelet. Water resistant to 30 meters. 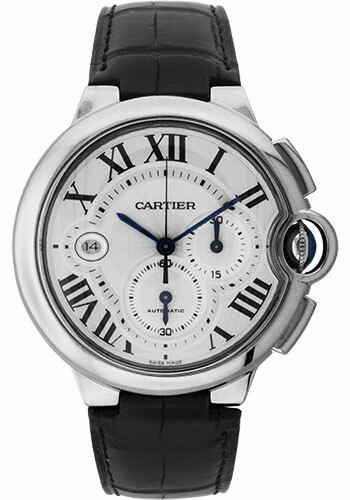 Extra large size (46mm) 18K white gold case, fluted crown with a blue sapphire cabochon, silvered dial with Roman numerals, manual winding Cartier caliber 430 MC movement, alligator strap with 18K white gold double adjustable deployant buckle. Water resistant to 30 meters. Extra Large (46.8mm x 47.1mm) 18K white gold case set with round-cut diamonds, transparent back, silvered guilloché and lacquered dial with sun-like finish, automatic winding calibre 8101 MC movement with chronograph function, 18K white gold bracelet. Water resistant to 30 meters.